Especially striking, its tenor line soaring over a quasi-orchestral vocal fabric, is the literary Leaves are Leaves; but finer stilll are the Four Alexis Kivi Songs (...) the main solo 'Melancholy' movingly underpinned by YL's awesomely dark, firm basses. It would be a mistake to bypass it, for this is not just choral music, but choral music by a Finnish composer, and the male choir is one of the most popular examples of the genre - the Finns love it. (...) Both (choirs) are, in a word, phenomenal, and well worth the effort and purchase. This comprehensive, magnificently sung collection has the field to itself. (...) The greater textural palette attained through using two differently sized choirs is more akin to early music. Einojuhani Rautavaara has a sensitive ear for the specific sound of a male choir. (...) The YL Male Voice Choir under Matti Hyökki phrases the music and pronounces the texts with great energy. The pure sound produced by the Talla Vocal Ensemble will caress your ears. Clearly, these singers and their conductors (...) have Rautavaara's music deeply entrenched in their souls. (...) splendid tribute to Finland's most significant musical voice. 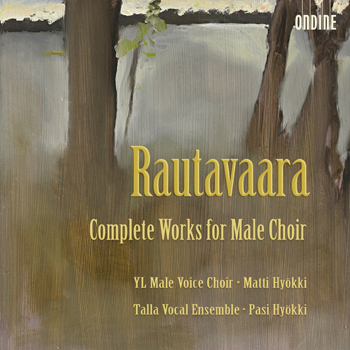 This double CD comprises Einojuhani Rautavaara's complete music for male choir - one of the most popular genres in the Finnish cult composer's artistic output. The two featured ensembles are YL Male Voice Choir (Helsinki University Choir), one of the world's most prominent male voice choirs and the prominent commissioner and dedicatee of most of Rautavaara's (and also Jean Sibelius's) works for male choir, and the Talla Vocal Ensemble, a smaller group of 10 singers originally founded within the YL Choir. Talla Vocal Ensemble, Pasi Hyökki: CD 1 (3, 4, 7, 9-11, 13, 14, 18), CD 2 (5, 7, 9, 11, 13). Tenor Tuomas Katajala is featured as soloist with several songs: CD 1 (19), CD 2 (6, 12). This release marks the culmination of the 80th birthday celebrations for Ondine's best-selling composer on October 9th. Ondine has had a long and fruitful association with Rautavaara since the late 1980s, having recorded the premières of many of his works and garnering many awards along the way, including a Grammy nomination for his Angel of Light (Symphony No. 7; ODE 869-2).